12. The Hate U Give by Angie Thomas. Starr watches as one of her oldest friends is killed by a white cop during a traffic stop. In the aftermath, she must discover who she is, who her friends are, and what her voice will be. 512 pages. (Finished 17 Mar 2019). 22. Killing Commendatore by Haruki Murakami. A thirties-ish painter is left by his wife and leaves his past life behind in the aftermath. Eventually moving into the house of his friends father (a famous painter in his own right), he discovers a never seen painting as well as his own desire for painting again. What happens afterwards is pure Murakami. 688 pages. (Finished 29 Dec 2018). This year is the first year I’ve been excited about the holidays since 2015. 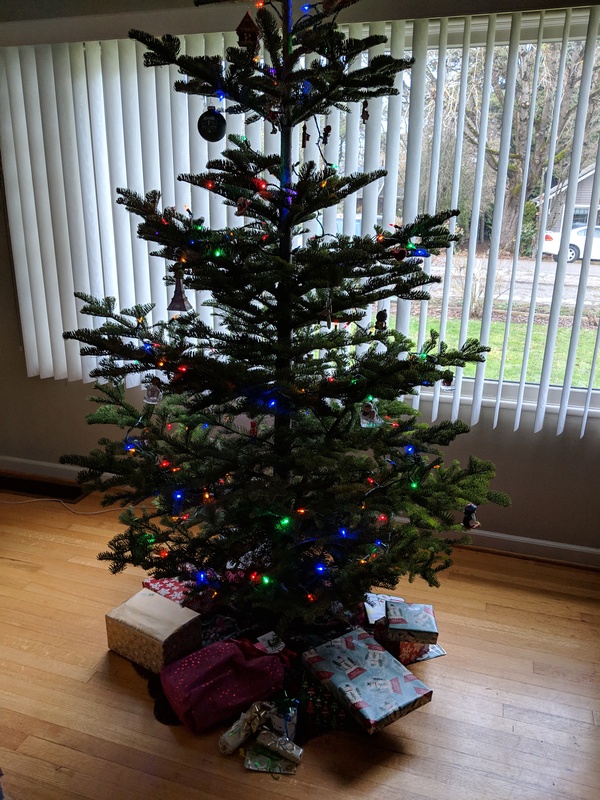 The first year I’ve put up a tree since then. It’s been nice to have a little more Christmas spirit this year. A couple of my friends and I journeyed up into Mt Hood National Forest to find Christmas trees this year. I only managed to get my truck stuck a couple of times in the snow before heading down to a lower elevation where I found this lovely tree. All in all 2018 has been a pretty good year. I’m really enjoying my job (even if it means I have way too many shoes now). I got a promotion in April and then in November got a temporary promotion while we work on a systems upgrade at work. Personally I’ve really focused on cultivating good friendships and letting friendships that were not as healthy fall away. It hasn’t always been easy and I’ve definitely had some missteps on the way, but I feel good about where I am emotionally as well. I was able to do a few trips this year which were a great blessing. In July, I was able to travel to Los Angeles (proper) for the first time in probably 5 years and visit my old neighborhood. I went to watch the Timbers play LAFC in their new stadium. While there I got a great behind the scenes tour of the stadium from my friend Jimmy who has a concession stand at the stadium. Other Timbers related travel included two trips to Vancouver BC. The first one was on official Timbers Army business as there was a possibility we’d have to hand off the Cascadia Cup to ECS (alas Seattle beat Vancouver in that match and as a result won the Cup). I also made it up for the last game of the regular season at the end of October.. The Timbers lost that match, but as always a great time was had in Vancouver (as well as lots of great food). There ended up being a little playoff magic again this year with an unexpected run to the MLS Cup. I traveled up to Seattle for a fun playoff matchup (we lost the game, but won the series in penalty kicks). I also traveled to Atlanta for the final. The Timbers didn’t get the result we wanted, but I had a great time eating my way through Atlanta with good friends. Like you’re walking along as always, sure you’re on the right path, when the path suddenly vanishes, and you’re facing an empty space, no sense of direction, no clue where to go, and you just keep trudging along. That’s what it feels like. Honestly I just don’t really get online dating that much. The only semi-successful relationship I’ve had that started from an online dating site was H, and that only lasted about a year. My most successful relationships have been ones that started organically with people I’ve already met. I haven’t necessarily been friends with that person before entering a dating relationship, just that the initial introduction has already happened. Unlike Jenny, I’m not ready to give up on dating yet, I haven’t even completely given up on the online sites. I don’t think my heart is really into online dating though. There are plenty of anxieties that I’m still working through regarding dating after my divorce and then the end of my relationship (and friendship) with H. I’m in a bit of a Catch-22 when it comes to dating. I want to date, but I don’t at the same time, or at my worst I don’t feel like I’m a good potential partner for someone. Like Jenny, what I really want is to work on both maintaining and finding quality friendships. I have my friend family both near and far, those folks that you can call up after not speaking for a year or two and its like yesterday, but I’d like to have a few more folks locally. It’s not easy making new friendships in your 40s (as I talked about in a previous post). I’ve reached out to folks to do things (overcoming my anxiety about this). I still spend way too much time watching Netflix alone on the weekends, but I am getting better about making sure I do still get out of the house and see another human at least once during the weekend. Over the past couple years, I’ve thought a lot about my friendships and what they mean to me. What is important to me in my friendships? What are my expectations? Are my expectations realistic? Am I being the type of friend I want someone else to be to me? I think that I can be a bit of a conundrum to friends. I can be both overly open about things and hard to crack as well. If you are someone I think I can trust, I’ll probably tell you more details then you want to know about something. At the same time, I lean towards a more introverted persona and I don’t often outwardly show a lot of emotion. I also don’t often push for more info from someone than is freely shared. I think this sometimes comes across as detached or indifferent. Which is often not the case. I do want to listen to the things that are going on in my friends lives. If I had one anxiety about friendships, it would be that I sometimes question if my friends actually want to hang out with me. It often feels like if I do something with friends, it is something that I have to instigate/plan. I know from talking to other friends that I’m not the only person that feels this way. My guess is that it is more widespread than not, especially with the busyness of life as we become older adults. I do know that it feels really good to be invited to do something with someone though. I’ve made a point of focus to make sure I acknowledge when it happens as well, whether or not I can actually take the person up on the invite. But what is a healthy friendship? There is always going to be some ebb and flow in any relationship whether platonic or romantic. For me, it is important that it is a relationship. There has to be some effort to keep up the friendship on both sides of the friendship. I’ve had to pull away from a friendship because it was largely one sided. I had another friendship that went a little dormant for awhile…and still probably isn’t where I’d like it to be…but has shown signs of life lately. Ending a friendship is painful. With the exception of my divorce, it’s probably one of the more painful things I’ve done. More painful than even the end of a romantic relationship. I don’t like doing it. Especially when you care deeply about that person. These feelings are fresh. This happened in the past few weeks. I can’t say that friendship is over forever, but for now at least it seems to have come to some sort of end. That still hurts…even if it is the right thing for the time being. Friendships are an amazing thing. I treasure each one in its own way. They have shaped who I am. They have been my family when I’ve been separated by miles from my actual family. Perhaps that is why they are so hard to step back from. I’ve had several conversations recently with different friends and family about how difficult it can be to both maintain and make new friendships as “adults.” I’m talking about maintaining friendships from childhood/college or making new friends in the post college time. People get married, some have kids. Between work and other family obligations, people get busy. Adult friendships are hard. Everyone is busy and life happens. I’ve learned you gotta text people when you’re thinking of them. A simple “thinking of you, hope all is well” really goes a long way. I have more to say about this subject, however my thoughts are kinda all over the place at the moment. I’m going to need some more time to make them a little more coherent (I’ve written and deleted 3 or 4 different paragraphs). In the meantime, anyone who happens to make it this far, I hope all is well with you. If we haven’t talked/texted/tweeted recently, I’d love to touch base and hear what is going on in your life. New music from Glen Hansard. Words that ring true recently.